Ice cream cupcakes are one of the latest dessert trends right now, so I thought I make some…and I might have a new favorite kind of cupcake! I have mentioned a few times how much I love ice cream cake. What I failed to mention is that one of my favorite parts is the frozen frosting…frozen buttercream. I don’t know why but I have always loved it. Even as a kid I would strategically choose my last bite with the perfect ratio of ice cream, chocolate chunks and the frosting. It seems like most of the ice cream places have switched to a whipped frosting on their ice cream cakes…what a shame. 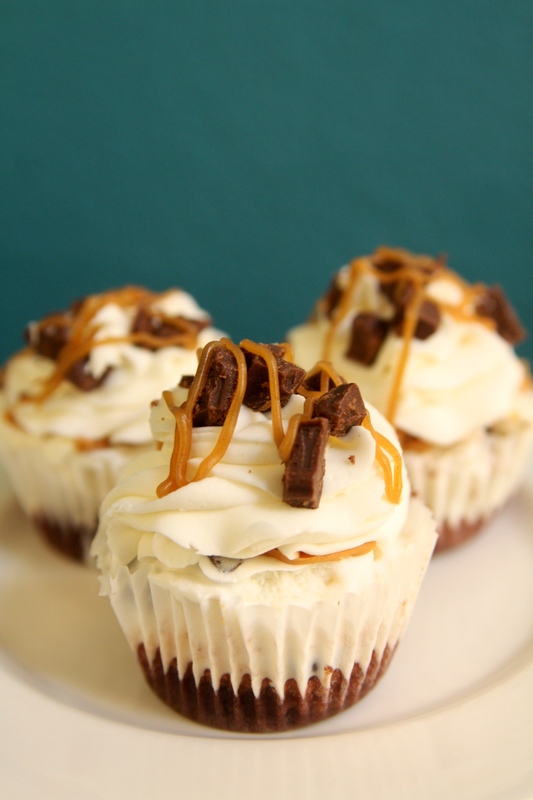 Frozen buttercream is one of the reasons I love these cupcakes…just one. Chocolate cupcakes, baked and prepared, cupcakes liners should only be filled about 1/4 full to leave room for the ice cream. Chocolate peanut butter swirl ice cream, softened. I found that the trip from the store home is a perfect amount of time to get the ice cream right for the cupcakes. Peanut Butter Syrup – you can create this using 1/4 cup Karo Syrup, 1/4 cup peanut butter and a little water…it was delicious! In large bowl, cream shortening and butter with electric mixer. Add vanilla. Gradually add sugar, one cup at a time, beating well on medium speed. Scrape sides and bottom of bowl often. When all sugar has been mixed in, icing will appear dry. Add milk and beat at medium speed until light and fluffy. After cupcakes have cooled, add layer of softened ice cream. Freeze until firm. After ice cream has frozen, add a layer of peanut butter. Place back in freezer while you prepare buttercream frosting. After frosting is finished, remove cupcakes from freezer. Using a pastry bag with a 2D tip, pipe frosting onto cupcakes. Garnish with chocolate chunks and peanut butter syrup. Freeze for at least 2 hours then enjoy! They are a perfect summer dessert! This entry was posted in Cupcakes, Frozen Treats. Bookmark the permalink.